The Australian Army did pretty well post-INTERFET, gaining two extra battalions and some new tanks and artillery. But today the Army has pretty much taken a back seat to Air Force and Navy in the headlines in the defence press, and in public and government discussions of Defence projects and spending. Expensive and/or controversial jets and fluoro vests in shipyards are more saleable for politicians and punters alike. The Army also seems to be the poor relative in terms of major projects, consistently receiving a smaller fraction of the capital investment budget than the other services. To some extent that relative lack of capital funding is understandable, as the Army has far greater personnel costs. The public profile makes sense too; the sums involved in the naval building program and the visibility of the fast jet acquisitions make them more contentious (and often more photogenic) than Army’s more dispersed capability investments. Because of its structure, in times of tight budgets Army is the most susceptible to ‘penny packeting’, by cutting vehicle fleets or spreading purchases out over longer periods. Army’s LAND 400 project to up-armour its vehicle fleet is just getting into its stride. Shortlisting for Phase 2 , to replace the ASLAV armed reconnaissance platform with just over 250 vehicles, was announced recently. But the next phase for 450 Infantry Fighting Vehicles  is an even bigger part of the perhaps $15 billion project. And it’s also where opportunities could open up for Army to exploit if it’s agile enough. The 2016 Defence Budget contained promises of some big spending boosts over the next decade—somewhere between $160 and $190 billion, compared to just $70 billion in the past decade. Providing that nothing happens to weaken the bipartisan resolve to increase defence spending (such as a tantalisingly close budget surplus preceding an election), Defence is likely to have more money than it can spend, creating opportunities for anyone who can fast track spending. That’s enough to cast doubt on the feasibility of being able to expend the promised funds over the next decade. But the Turnbull government’s taken some policy decisions that’ll make it harder still. The Howard government spending included a number of big off-the-shelf purchases (Super Hornets, C-17s, Abrams tanks, HMAS Choules) and the hybrid ‘hull off-the-shelf fitting out done locally’ approach taken to acquire the LHDs. It was relatively easy to shovel money into those purchases. Less successful in terms of moving dollars through doorways were the developmental projects undertaken post-2000 (air warfare destroyers, Wedgetail and multi-role tanker transport aircraft, and two developmental helicopters in the MRH-90 Taipan  and ARH Tiger ). The take home lesson was that spending is easiest when buying proven equipment from established production lines. But the government now has a defence industry policy  that emphasises innovation and local spending. The word ‘innovation’ appears in the Defence Industry Policy Statement no fewer than 186 times, while ‘off-the-shelf’ appears once—in a box looking back to the post-2000 White Paper period. And the PM said that  ‘every dollar we spend on defence procurement as far as possible should be spent in Australia’. There’s nothing wrong with innovation, in its place. It’s what provides the ‘capability edge’ so beloved by White Paper authors and underpins hopes for a new ‘offset strategy ‘. And Australian industry can certainly contribute some great ideas . But it takes time to move from innovation to production. Trying to rush it leads to big problems down the track, which leads to schedule delays and, paradoxically, slower than expected spending. A corollary of Augustine’s XXIVth Law  is that ‘the best way to slow down a major project is to accelerate it’. And, before I ease off on beating the dead horse, I’ll just note that the more developmental and more ‘Australianised’ the project, the more it’s likely to be delayed . The timeframe for the cutting of steel on the future frigate and offshore patrol vessel projects, driven in no small part by the politics of shipyard jobs, is pretty aggressive. It’s possible that once serious scoping work is done there’ll be a delay in getting to work, as the alternative’s to rush into production with designs still in flux. If so, a plan for LAND 400 that’s flexible and able to be ‘surged’ might be just what a department staring down the barrel of a significant underspend is looking for. That much of the work can be done in Australia without a lot of tooling up and industrial restructuring can only help. Correction: an earlier version of this article incorrectly stated that LAND 400 would acquire an additional 1,300 vehicles, rather than the 450 currently in Phase 3. The error was the author’s. Andrew Davies is senior analyst for defence capability and director of research at ASPI. This article is adapted from a longer piece in the September 2016 edition of Australian Defence Magazine. 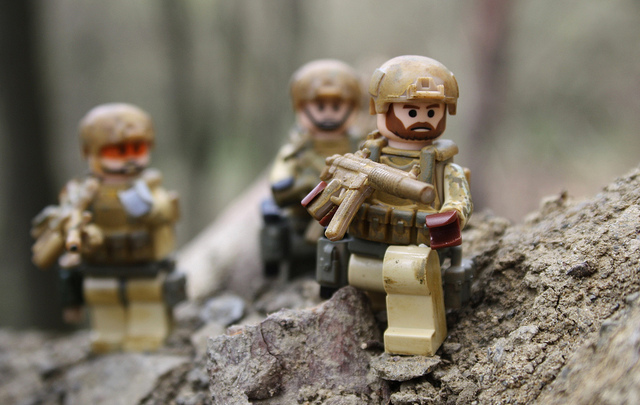 Image courtesy of Flickr user leg0fenris.